AleaSoft, November 27, 2018. 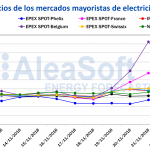 AleaSoft presents a series of reports on the main factors that influence the price of the Iberian electricity market MIBEL. In this first report, AleaSoft analyses the influence on the price of external factors to the electricity market, such as the price of fuels and the price of CO2 emission rights. Without any doubt, the concept that held the most headlines in the electricity market section during this 2018 has been CO2. Carbon emission rights are the tax that polluting industries must pay for releasing carbon dioxide into the atmosphere. This mechanism is designed so that the transition to producing with lower carbon-emitting technologies is faster, making less profitable those technologies that pollute the most. Industries can acquire these emission rights in the auctions organized by the governments. But there are secondary markets, where these rights can be resold, for example because a certain industry is no longer needing them, or simply buying, hoping to sell it again at a more expensive price. The fact is that the generation of electricity in coal-fired power plants emits CO2, and as such, it must acquire carbon emission rights. An extra cost for the plants that, in order to maintain profitability, must be transferred to their energy sales offers in the electricity market. Also gas combined cycles and cogeneration, although they emit much less CO2, must acquire emission rights. So, an increase in the price of CO2 has a direct impact on the price of the offers of these technologies that, when they set the marginal price of the electricity market, it notices an increase. The price of the EUA emission rights for December 2018 began this year trading below 8 € per ton of emitted gas. That price did already increase from 5 € in July 2017, and had been traded around that price for several years. Since then, the bullish race has been unstoppable, reaching its maximum at 25.23 €/t on September 10. A rise of 223% in barely nine months. This increase in the emissions price has been accompanied by an increase in the price of the Iberian electricity market of 42.6%, from the 49.98 €/MWh average price in January to 71.27 €/MWh average price in September. 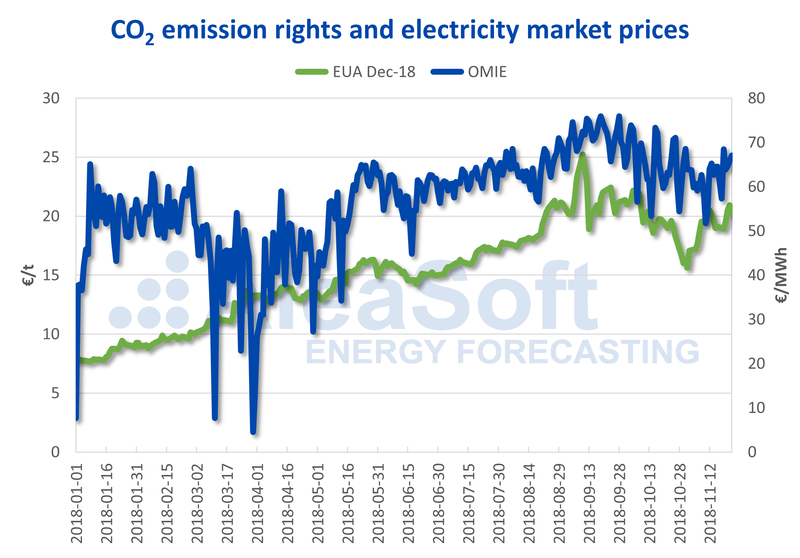 Looking into 2019, AleaSoft estimates that the price of CO2 emission rights will continue to rise. The entry into operation of the Market Stability Reserve will allow the European Union to prevent the fall of the emissions price, and make it a tool to accelerate the decarbonisation of electricity production and meet 2030 environmental objectives. Published studies indicate that the price of CO2 should increase by an additional 50% to make the electricity generation with gas more profitable than doing it with coal, and this is the first essential step to advance in the decarbonisation of the electricity sector. Sources: Prepared by AleaSoft using data from ICE and OMIE. The gas price is also an important factor that affects the price of the electricity market. Although gas is not the main electricity production technology in the Spanish electricity market (combined cycles and cogeneration have a production share of around 22% so far in 2018), it is the technology with the most expensive offers in the market, so it is a reference for the offers of other manageable technologies. 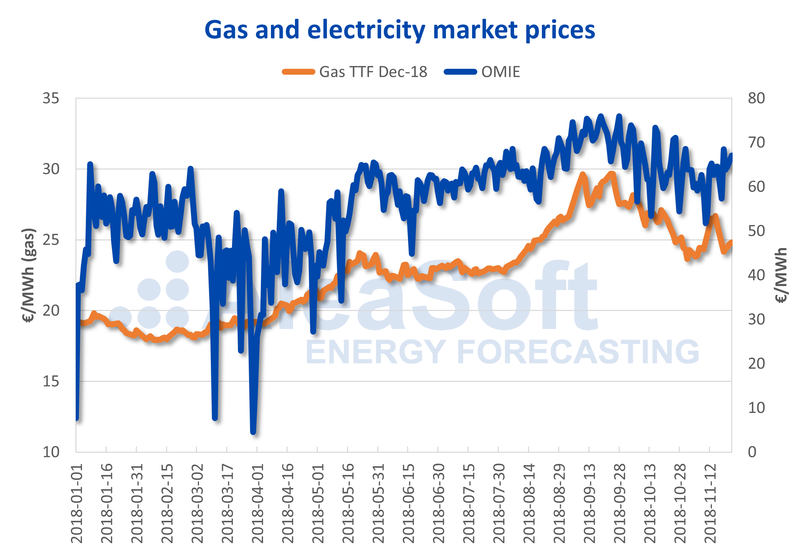 The price of European gas TTF has had a bullish behaviour similar to that of CO2. The price of the future for December began the year at 19.14 €/MWh and peaked at 29.67 €/MWh (a rise of 55%) on September 24, practically at the same time as CO2 price did. For 2019, today the accumulation of gas reserves for the winter, which at the moment is not expected to be severe, makes an increase in the price unlikely. But a winter with lower-than-expected temperatures can reduce gas reserves and push the price up. The rises in the price of CO2 and gas are the key factors in understanding the rise in the price of the electricity market in 2018. Coal is also one of the technologies with a notable share of the mainland electricity mix. So far in 2018, it has meant around 14% of the production. Being a manageable technology, it also sets the marginal price of the market at certain times and its price is also a factor that influences the price of the electricity market. The price of European API2 coal also had a bullish behaviour in the global of the first three quarters of the year. The price of the future for December recorded its maximum in October close to $102 per ton. Since then, its price has not stopped falling and is already at $83. 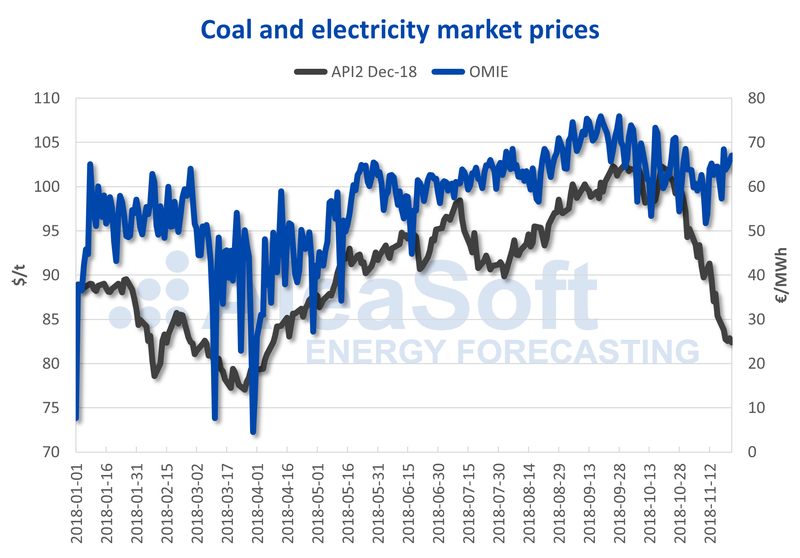 The outlook for 2019 of the coal price is to continue falling. 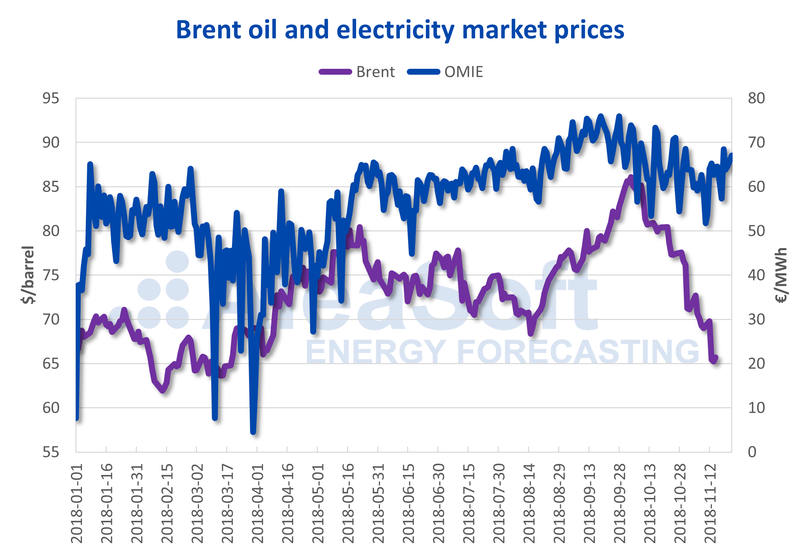 Although fuel oil is no longer used for electricity production, the behaviour of the oil price is still a reference for the electricity market. Some gas contracts are indexed to their price, and in general, the oil price can set the direction of the economy worldwide. Like coal, the price of a barrel of Brent oil recorded its annual peak in October above $86, and since then it has fallen down to $60. 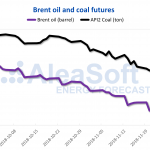 The forecasts of several sources combined by AleaSoft indicate that the average price of Brent oil during 2019 will decrease. Sources: Prepared by AleaSoft using data from EIA and OMIE.